Ashram is like a Yatra Dham during sacred Shravana month. Hundreds of devotees came and offered to the Lord Vishwanath a special pooja, Rudrabhishek, Rudripath, Prathiveshwar Pooja, Prahar Pooja etc. through out the holy month of Shravan. Lakhs of sacred Bilva Patras were offered to the Lord also. In the evening daily discourse on Maha Shivapurana by H. H. Sri Swami Adhyatmanandaji Maharaj was a special treat for the devotees. Holy Shiva Purana sings the glory of Lord Shiva and His worship. It touches almost all the aspects of worship and devotion in Spiritual life. Swamiji pointed out that Shiva worship should not be limited to rituals at the temple only but it should be blended with introspection and intense Sadhana, which leads individual soul to the realization of the absolute and to make the Jiva (individual soul) establish in the blessed form of Siva. It is possible in this very Birth. On the last day of the month, a special Havan (Yajna), Homatmak Laghurudra on Shravani Amavasya day (Sept 9, 2007) will be performed in front of Sri Vishwanath Temple in a grand manner. In this Yajna, oblations will be offered, with the recitation of Mantras of Rudra – Adhyaya from Yajurveda. Yajna will be concluded in the evening and it will be followed with a grand feast (Bhandara) to all. Large numbers of new comers joined this month for the Morning Yoga Session (5.30am - 7.00 am) scheduled for the beginner from Aug 1, 2007 to Aug10, 2007 and Aug 15, 2007 to Aug 25, 2007. Yoga classes for Established and Advanced students were scheduled in different batches at 5.30 am, 7.00 am and 10.00 am in the morning. Evening Yoga classes for Women group and a special group were scheduled from 4:00pm , 6:00pm and 7:00 pm. A team of dedicated yoga teachers namely Sri Snehal Bhatia, Mr. Dhawal Patel, Ms. Devashree Oza, Ms. Dhara Upadhyay, Ms. Sonal Trivedi, Ms. Sangeeta Thawani, Ms. Brinda Pandya, Smt.Surekha Sonar and Mrs. Janki Shah conducted and coordinated all the classes. A special satsang was held on 44th Mahasamadhi day, Aradhana day of Brahmleen SadGurudev Sri Swami Sivanandaji Maharaj at the Ashram on Aug 7, 2007. Large number of devotees participated in Holy Paduka Pujan, prayers, and satsang. Devotional Bhajans in sweet voice of Smt. Mayurikaben Oza brought a special fervor in the satsang and Dinner (bhandara) was serve to all ..
On Aug 12, 2007 Sri Vishnu Sahasranam and Sri Lalita Sahasranam Archana was performed by devotees of Sri Astik Samaj at Sri Sri Sri Ashta Laxmi Bhawan. On Aug 15, 2007 - 60th Anniversary of India’s Independence Day flag hoisting was done by Rev. Sri Swamiji Maharaj at the ashram and a day long Sadhana Shibir was organized by Yogada satsang at the Ashram. A delegation from the ashram visited the Governor’s house at Gandhinagar honoring an invitation of H. E. Governor of Gujarat, Sri Naval Kishor Sharmaji for Independence Day celebration and get together social. At this function, H. E Governor Sharmaji took an opportunity to praise the work of Pujya Swamiji. He is a frequent visitor of Sivananda Ashram and a observer of the services at the ashram. In his words, “Sri Swami Adhyatmanandaji is a Gem, highly scholarly literate personality and fountain of inspiration." On Aug 11, 2007 a special musical evening function was held in the loving memory of late Mrs. Rita, daughter of Prof. Nagar and sister of Dr. Ranjana, at Sri Sri Sri Ashta Laxmi Bhavan.Two books were released by Pujya Swami Adhyatmanandji - the first one “Patit Pavani” in Hindi by Acharya Ambashankar Nagar and its translation in English by Mr. Sadani and a second book “Indian Women’s Amtoliographies” by Dr. Ranjana Harish. 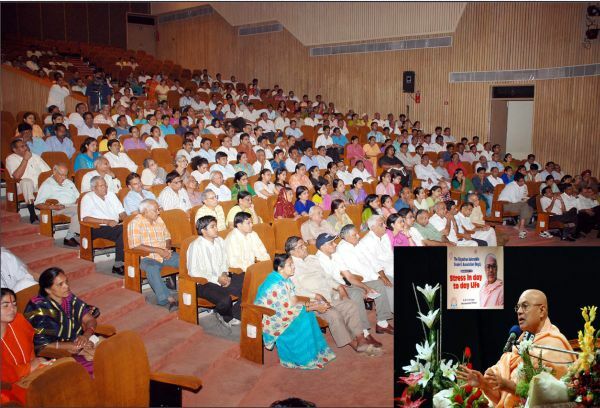 On Aug 20, 2007 Sri Swamiji Maharaj addressed a grand gathering of youth at Smt. Jaymanben Dave and Sri Hirabhai Kanya Vidyalaya on the subject of Worship of Lord Shiva and its implication in modern education. On Aug 28, 2007, “Yagnopavit Upakarma Vidhi” (sacred thread changing ceremony) was performed very solemnly by “All Brahmin Samaj” and “Astik Samajam” of South India on the Holy Raksha Bhandhan Day. On Aug 29, 2007 Divya Bhaskar, a leading news paper organized a dialogue on “Diet and Nutrition Program for women at Sivananda Ashram. Dr. Kalpana Shukla, well qualified in the subject conducted the program. Sri Swami Adhyatmanandaji graced the gathering. Honoring an invitation of H. E. Governor of Gujarat Pandit Sri Nawal Kishore Sharmaji, Sri Swami Adhyatmanandaji Maharaj traveled together to Jaipur by air. At Jaipur airport they received a royal welcome and flower reception. 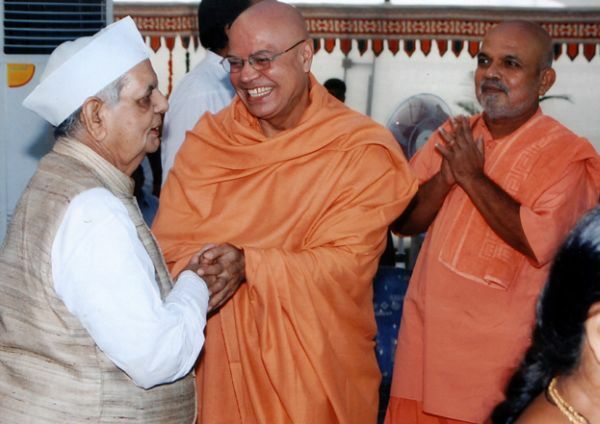 Sri Swamiji Maharaj attended many functions, addressed to private and public meetings during his visit to Jaipur. 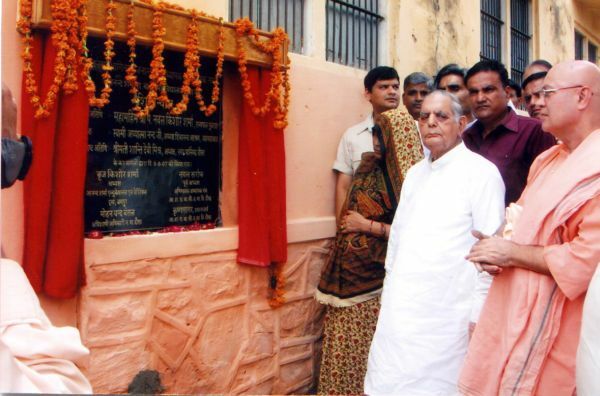 One of the main function was at Dausa, Governor’s home village. With H. E Governor, Rev Swamiji attended a special event of laying the foundation stone for computer lab and library at Senior Girl’s High School. Also a tree plantation project on a mass scale was inaugurated and initiated by Rev. Swamiji Maharaj and H. E. Governor of Gujarat Sri Sharmaji. Sri Swamiji’s itinerary was full of programs, discourses and meetings including at Global Institute of Technology, Institute of Management’s Technology and at Maharana Pratap Bhawan. A function at Sri Bharatiya Vidya Bhawan was organized which included Tree Plantation and Blood Donation drive also. Late Sri Moolchand Agrawalji’s family members and others worked diligently to make Swamiji's visit at Jaipur for the benefits of many people . On Aug 11, 2007 Sri Swami Adhyatmanandaji Maharaj and H. H. Sri Swami Narayan Swaroopanandaji Maharaj from DLSHQ, Rishikesh visited Dholaka on the sincere and humble request of Dholaka Education Society and Senior Citizens Forum. At Government high school, a special function was organized and prize awarded to bright students of the year. Rev. Swamiji Maharaj inspired children with His words of wisdom. Sri Arunbhai Oza, a vice president and a trustee of Sivananda Ashram also accompanied Sri Swamiji at this function. 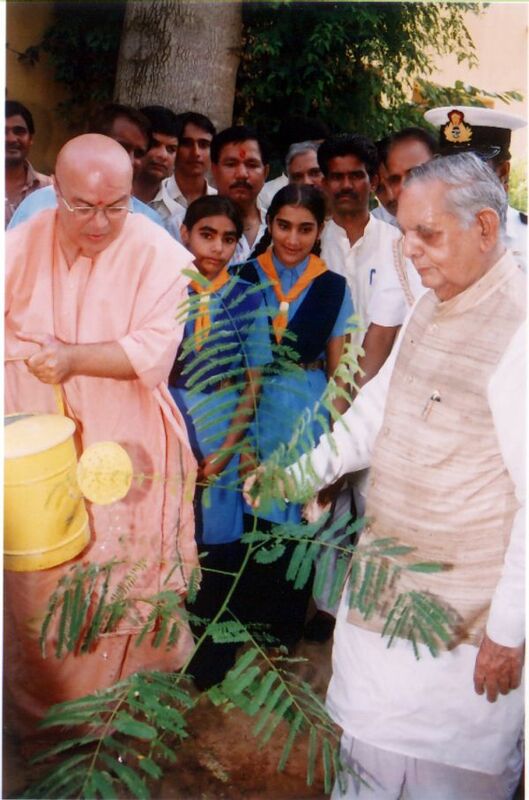 On Aug 16, 2007 Sri Swami Adhyatmanandaji Maharaj made a quick visit to Rajkot. He started at 5:00 am and return back by 4.00pm for Sri Sri Siva Puran Katha. He addressed a gathering at newly constructed “Sivananda Bhawan’ by Sri Divya Jivan Sangh, Rajkot. Sri Swamiji Maharaj was specially invited to preside over 86th year annual function of “PHULCHHAB’ a daily newspaper. The editors of "Phulchhab" are known for his good and balanced news policy – “Samyak- Achar” samachar. Sri Swamiji also made a lucky draw for its annual subscribers. Most Worshipful and Revered Dadi Prakashmaniji, the Head of International Brahmakumari Institute Mount Abu, passed away on Saturday Aug 25, 2007. Her last rights cremation was done on Monday, Aug 27, 2007at 10:00 A.M. Sri Swamiji attended the funeral ceremony.